I went to a play last night, part of my secret plan to resume being human. You know. Do things. So I always say yes when my wife asks, and she asks a lot. She has a lot of students and gets a lot of comps, and there’s a lot of live theater in Seattle. That’s why we moved here, and it’s changed but not stopped. Companies thrive and die, but the cycle doesn’t give up. At least three local theater companies are often last or nearly-last stops for shows that are bound for Broadway, and I could go on. Lots of great regional theater out there. I’m just saying a lot of it is here. And this was an excellent local company, now branching into two locations, always cast with superb, working actors, most of them Equity, a fair amount of them touring when they’re not in a Seattle show. So. The musical was so-so, but I’m still thinking. I won’t review it, because it won’t go anywhere and really was just a fun thing for them to do, even with some spectacular talent on display. It was obviously a play built by committee and based on an inside-joke, all of the clichés and tropes of the conventional American musical comedy gathered into what was essentially a 100-minute sketch on musicals. It was a metamusical, in other words. Fun. Not going into any canon. It was the first time it struck me that my jazz hands days are over, although that’s not a hard call. I mean. My theater days have been over for decades. I suppose, in the back of my mind, having been reared in a musical-playing household, incubated with Rogers & Hammerstein, I always thought, maybe. You know, maybe. Hey, somebody asked me to be in a movie. That’s a pretty strange thing to happen. But there are no roles. No more. I could think of juicy musical roles that possibly a guy like me could pull off (Henry Higgins, Tevye, Fagin, a new musical based on Old Man and the Sea), but it won’t happen, I don’t even fantasize about it, and last night I just noted it. There are millions of these things. Most of them related to sports, the more I think about it, although I’m never to go master Spanish or Danish or Russian or Mandarin, or even begin most of those. I’m never going to run for public office. I’m never going to be even a good faker at jazz piano. These were all things I once dreamt about. You give up dreams, you just do. We all do. We move on. And yes. Sometimes your dreams, in odd ways, don’t give up on you. Just talking percentages. I’m not going to be in The Music Man, at least not playing Prof. Harold Hill. Although I’d be very good. I write a lot of nothing in this blog lately because I haven’t been very active on social media, and a couple of people sent me messages, concerned. Warmed my heart a bit, although, as I told them, sometimes I just feel the need to stay quiet. I tend to get upset at people who don’t deserve it; I ranted the other day about people who posted ordinary pictures of pets and food while another mass murder took place and we had a fairly important national election, and who do I think I am? Post what you want. So there’s that, but I’m OK. This is a lot like last November (thanks, Facebook, for reminding me), when some days I had trouble getting out (and staying out) of bed. It’s dark and no fun, but it’s not dangerous in terms of physical danger, so thanks, no worries. Blue, a bit, definitely. Kind of lost. Gaining weight, though, in a sort of deliberate attempt to eat more than my body wants. The tricky part is that the high-calorie stuff is mostly junk, and I hate the idea of putting on pounds via ice cream. When I don’t really need to. I need to stop losing. A few more would be nice, but ideally I’d research and maybe get some help and try to add some much-needed muscle weight as opposed to fat, but that’s hard to do. And while my scale today has me up a whopping 9 pounds since October 31, I know that’s really about half a pound. I could hang onto this magic weight only by eating meals late at night and a lot of them. In a few days it’ll drop back down. But hey, I’ll take that half a pound and work on it. Lastly, it amuses me how I get little jolts of excitement when I order something from Amazon, which is almost always something small and technological. A new Bluetooth dongle. A USB hub. Like that. Since I’m a chronic Google Maps user when I drive, more often just for advice on faster routes when I’m negotiating the stasis that passes for I-405, I’ve always had some sort of phone holder for my dashboard. After a couple of bulky ones, I discovered I really like the magnets. A magnet on the back, a magnet thing somewhere on your dash. Slap the phone up there, bring up the map, and it’s right there, off in the corner of my eye. I’ve been using this particular one, which fits inside one of the heating/AC vents, for a few years now. It didn’t really work with the new car. I didn’t mess with it too much, as I’d lost some affection for it (running the heater tends to heat the phone up, who knew? ), and last week I found the perfect one. 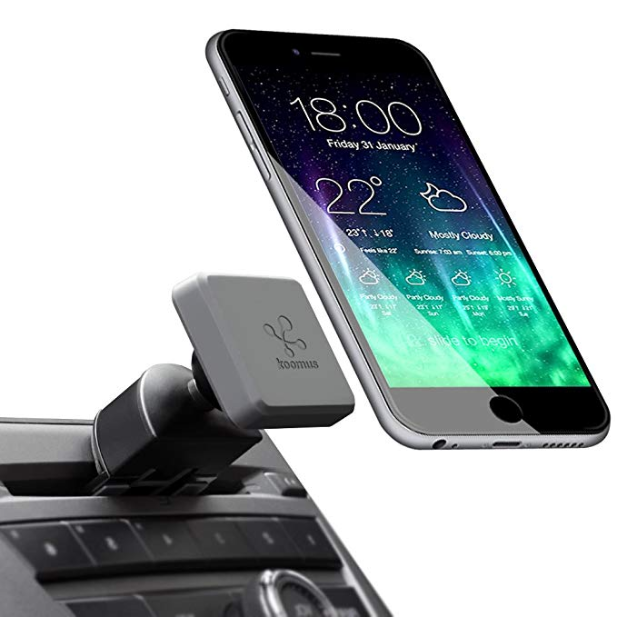 It slips inside the CD player slot (but easily slips back out when not needed), very secure, and it’s got a big magnet that keeps the phone steady and able to be manipulated a bit. So tonight I’m driving to a dinner meeting down south by myself, and I get to use it for the first time, and suddenly I’m pretty excited. Probably be singing musicals all the way there, too.